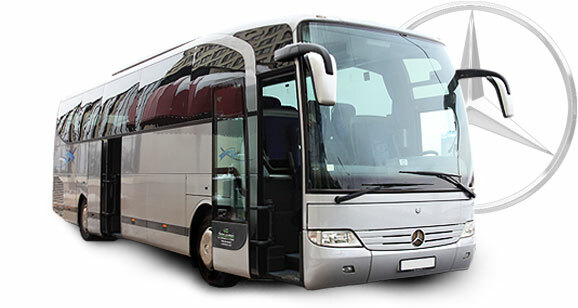 Best coach buses for your travels. We also specialize in professional transportation services with a big group transfers for longer distances. All the Riga Limo Service coach buses are maintained on an excellent technical condition and are surveyed by qualified specialists, which is why we will secure the fastest and safest service for your long-distance trips. All the Riga Limo Service coach buses are equipped with all the extras necessary to make passenger trips comfortable and safe. We will be glad to become your loyal partner on the road, so let us discuss your trip details. The Mercedes Benz Travego charter bus provides passengers with safety and wellness. Suitable for long-distance trips and groups up to 40 people. We also offer the professional guide assistance during your trip.